What a beautiful sight indeed! 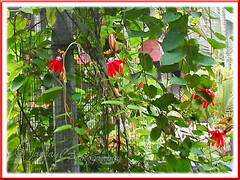 Live and flaming red flowers decorating the vining stems of Scarlet Passion Flower that were draped on a trellis built of dexon steel bars! It was sighted at the Church of St Paul The Apostle in Kuala Kubu Baru, Selangor during our pilgrimage tour to that church last year. Our first time seeing this gorgeous vine with brilliant red blooms in Malaysia! Never knew that this stunning tendril climber did exist in our tropical country before that. How ignorant! And, just less than one and a half months later, we got to enjoy the Red Granadilla again at Rimba Ilmu Botanic Garden, Universiti Malaya in Kuala Lumpur. 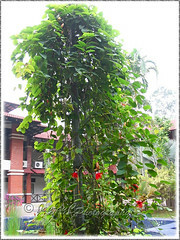 Such a wonderful surprise and it looked strikingly beautiful as it draped over a 4.5 m tall pole! Truly an outstanding ornamental specimen in the courtyard of Malaysia’s world-renowned ‘Forest of Knowledge’, the Botanic Garden’s other name in English! If you’re searching for a vine, one with exotic and drazzling blooms in vibrant scarlet red and uniquely structured, then look no further but allow this tropical beauty, the Red Passion Flower, to enchant you and welcome her into your garden. Note: for decades, it was erroneously known worldwide as P. coccinea Aubl. but found to be a different species from the true P. coccinea by John Vanderplank in 2006 who correctly described and published its new name as P. miniata Vanderplank. Etymology and name: The common name of Passion Flower was instituted by the Spanish Christian missionaries to South America in the 15th-16th centuries who interpreted various structures of the plant as symbolic of the last days of Jesus Christ and his crucifixion. Check at Wikipedia to know more of this religious symbolism and other names adopted in Europe and elsewhere. Origin: Native to Southern America – Bolivia, Colombia and Peru in Western South America and Brazil. 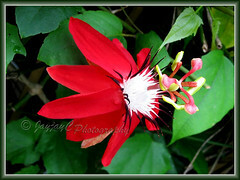 Features: Passiflora miniata Vanderplank is a one of the most beautiful species of the genus Passiflora that has about 500 species of tropical vines. A large, hardy and vigorous climber, it is fast-growing and can reach a height of 3-6 m or more, clinging with tendrils to anything it touches and covers structures fairly rapidly under favourable conditions. If ground-grown, it can become invasive, spreading by suckers and rooted vines. Needing sturdy support, it’s great if grown on trellises, arbors, chain-link or garden fences, poles with wire-netting, and the like. An evergreen perennial vine in warm and frost-free regions and semi-evergreen in colder clime. It has a lush and dark green foliage that blends well with its strikingly beautiful scarlet red flowers. The leaves are simple and not lobed, oval to oblong-shaped with double-toothed margins and arranged alternately on the wiry and angular stem. Spiral-like tendrils are produced in the leaf axils to aid its aggressive climb. The flowers are spectacular, opening from torpedo-shaped oval buds that are encased in reddish bracts and will bloom abundantly throughout the year in the tropics or from summer to fall in temperate climes. Its flower structure is truly fascinating! The 10-petaled flower consists of 5 petals and 5 sepals, strap-like, in bright scarlet red that bent backwards like a reverse bowl, 6-10 cm in diameter. Emerging centrally, in front of the petals are three series of corona filaments with the outer series in dark purple and slightly oblique outward and the other 2 inner ones in white, different from the true P. coccinea that has white or pale pink corona filaments in two series. A glabrous tube protrude upwards from within the throat, and sitting atop it is seen a yellowish ovary that is fused with 3 reddish-pink styles and stigmas above, and 5 red-spotted filaments tipped with yellow-green anthers below. Very captivating, somewhat resembling a colourful propeller. No wonder, the Red Granadilla or Scarlet Passionflower is a wonderful attractant for wildlife, such as the hummingbirds, butterflies and bees. Also, a host plant for caterpillars that will gorge its leaves, making them holey and unsightly. Flowers will eventually develop into roundish melon-like delectable fruits, with variegated skin that is mottled in green and yellow and contain numerous seeds inside. The passion fruit (up to 5 cm in diameter) with edible pulp is pendent, unlike erect in P. coccinea. View how the fruits look like at Flickr images. Culture (Care): Passiflora miniata Vanderplank (Passiflora coccinea hort.) is an easy to grow vine with low maintenance. Light: Enjoys full sun to light shade. In very hot regions, semi-shade is preferred, otherwise the foliage may scorch in direct sunlight. It blooms best with good sunlight. Protect it from strong wind. Moisture: Average water needs. Water moderately and regularly, keeping it evenly moist. More water during hot seasons and when fruits are maturing to prevent them from shriveling and falling prematurely. Less water during cooler temperatures, allowing soil to dry slightly between waterings. Soil: Well-drained humus soil with a mix of coarse sand and loam. Others: Requires regular pruning to keep it within control, as well as to encourage more blooms with new branches as flowers appear on new growth. The vine is hardy and can tolerate hard-pruning. Periodically, prune out inner growth to maintain good air circulation to discourage fungal diseases and keep it healthy. Feed once fortnightly with a balanced fertilizer during active growth. Repot only when necessary as it tends to flower more freely when pot-bound or top-dress instead to rejuvenate growth. Relatively free from serious pests and diseases, though attractive to caterpillars that feed on its leaves. For subtropical regions: Hardiness: USDA Zone 10-12. Grow this tropical vine in containers if not winter-hardy, as it will not tolerate prolonged frost and freezing temperatures. A tender evergreen that is semi-deciduous to deciduous in colder regions. Blooms all summer long till fall. Prune vine as needed in early spring. Propagate by stem cuttings in late spring or early summer. Propagation: Can be propagated by seeds (it does self-seed too) or cuttings, the latter being a simpler and faster way. 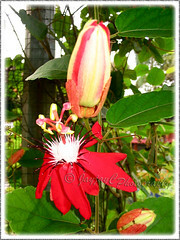 Check here on how to propagate a passiflora vine from cuttings …hehe, our success story. Branches that become rooted at leaf nodes when grown as groundcovers can be used to propagate new plants too. 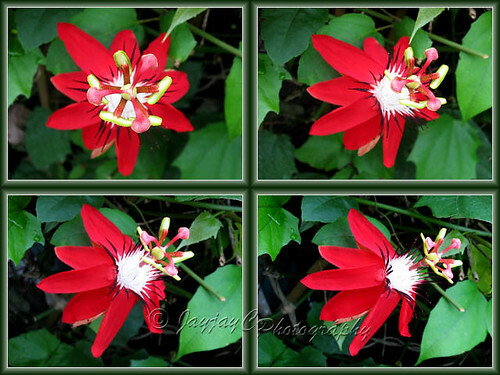 Usage: Grow Passiflora miniata or Scarlet Passion Flower to cover and decorate garden fences, trellises, arbors, pergolas and arches. Can be trained up a pole, enclosed with wire-netting as a stand-alone garden specimen for added beauty and interest. Use as a ground cover or espaliered on walls for the brilliant red flowers. If you’re a nature lover, use them to attract wildlife, such as bees, butterflies and birds to your garden. Or plant them in containers to overwinter plants indoors in non-hardy regions or simply to enjoy the beauty of their exotic flowers or edible fruits as an added bonus. Passiflora tecta, as described and published by Christian Feuillet. Bright scarlet red flowers with 3 rows of corona filaments in bright red, and with the outer filaments held nearly erect and slightly oblique inward. It has ovate and bi-serrate leaves. 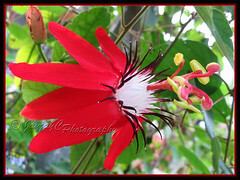 Passiflora manicata, with bright scarlet 9-cm diameter flowers, dark bluish-purple corona filaments and dark green 3-lobed leaves. 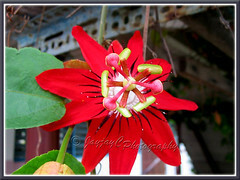 Passiflora vitifolia, with large scarlet red flowers, 3 series of corona filaments with outer row coloured scarlet and slightly oblique outward and the 2 inner ones white. It has dark green 3-lobed leaves. Gerbera jamesonii (Barberton Daisy), in an explosion of dazzling colours! Abutilon megapotamicum, definitely an eye-catcher! Quisqualis indica (Rangoon Creeper), simply spectacular! I am trying to grow this vine in my garden. I didn’t think twice when I first saw the seedling at a local nursery and decided to give it a try. The plant on display at the nursery was doing so well. However, it is growing very very slowly and the leaves are not green, but slightly yellowish. I am keeping my fingers crossed now. Oh, how lovely that you’ve got this red beauty for your garden, Autumn Belle! Wish you much success, my friend! How are your cuttings doing now? Wah, you got a good memory, James! You’re referring to the ones that I propagated last August, right? Yes, we kept only 2 plants for ourselves, one at the backyard and the other at the frontyard, and both are growing fairly well though foliage aren’t as lush as expected. Wonder how soon will they flower and bear fruits? Thanks for bringing up this matter, James…as I think an update at that post is long overdue! Je recherche depuis longtemps la passiflore miniata, j’ai acheter des graines qui ne germes pas. je suis vraiment désolé . Y-t-il une ou un internaute qui puisse m’aider ?